(Legend under map) Beyond the tree line about 2 3/4 miles in front of this marker, Horse Creek flows into the North Platte River. There the treaty was signed September 17, 1851. 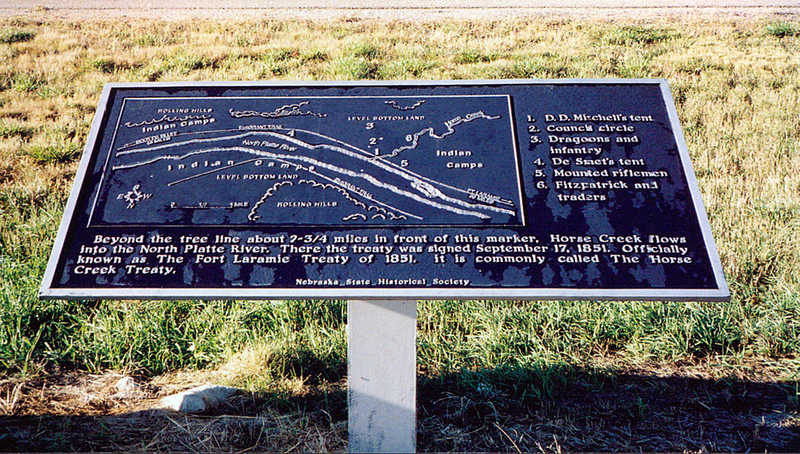 Officially known as The Fort Laramie Treaty of 1851, it is commonly called The Horse Creek Treaty. “Map of Horse Creek Treaty Grounds,” Explore Nebraska History, accessed April 19, 2019, https://mynehistory.com/items/show/466.